Steve Oppenheimer was born and raised in Maryland, growing up mostly in the Washington, D.C., metro area, and has lived in many parts of the country, including New Mexico, Ohio, Missouri, Massachusetts, Washington (state), Wyoming, and California. He has been playing music since he was four or five years old and has performed in a broad variety of styles, including blues, R&B, country, folk, jazz, rock 'n' roll, and acid rock. Steve studied piano, composition, electronic music, and audio engineering at the Berklee College of Music and spent over a dozen years as a full-time professional keyboardist, singer, composer, arranger, and band leader. In addition to his years as a session player and touring musician, he sometimes worked as a sound-reinforcement mixer. He holds a BA in Cultural Anthropology from the University of Maryland, College Park, having also studied at Miami University (Ohio), Montgomery College (Maryland), and the University of New Mexico. A dog lover for as long as he can recall, Steve has owned several German Shepherds, two Kuvaszok (a large Hungarian livestock-guardian dog), and a German Shepherd-wolfdog. He currently lives with Attila (Intl/Am Champion Double Ring Barbarian, CGC), his award-winning Kuvasz. Steve worked briefly at a guard-dog school in New Mexico before moving to California in 1983. His first job in California was at Elizabeth Kondor's Pyramid Ranch Kuvaszok in South San Francisco, California, where he became the kennel manager and was privileged to work with some amazing dogs. He later worked as kennel manager of Bayshore (boarding) Kennels/Waltraut German Shepherds, owned by GSD breeder Sue Cogliandro. After touring with bands for a few more years, he finally got off the road in June 1987 and returned to work at Pyramid Ranch Kuvaszok, helping to open the new kennel facility near Sacramento, California. Toward the end of 1987, Steve was introduced by his brother Larry the O to the folks at Mix Publications and started working there as a freelance proofreader. In January 1988, he joined full time, proofing and copy editing Mix and Electronic Musician magazines and the Mix Bookshelf catalog. He soon moved entirely to EM and worked there for more than 20 years, including more than 10 years as editor in chief of Electronic Musician, as well as countless buyers' guides and special projects. 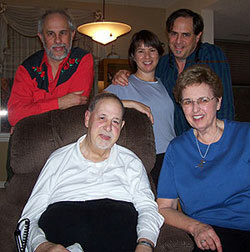 He also was the founding editor of Remix, Onstage, and Music Education Technology magazines. He then became Director of Technology (including rich media) for the Penton Media Audio Group (which includes Mix, EM, and Remix) and editor of AudioInsider.net until he was laid off in June 2008. Publishing is a tough business but then, so are most businesses today. Continuing his dog-related activities, Steve independently rescued several German Shepherds and in doing so met and joined San Francisco Bay Area German Shepherd Rescue (now defunct) in 2000. He immediately became active as an adoption counselor and fosterer and has fostered more than 50 German Shepherds during the ensuing years. He cofounded German Shepherd Rescue of Northern California in 2001 and served as its president and director. He co-founded Greater California German Shepherd Rescue in 2007 and currently is its president and chairman. 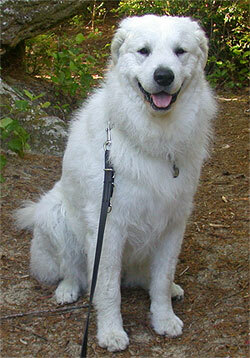 Steve is also a member of the Kuvasz Club of America and the Oakland Dog Training Club. An inveterate reader with a huge library, Steve has a wide variety of interests, including U.S. and world history, sports, natural history, fine art. A good vacation is a road trip with Attila in their customized Dodge Sprinter van, visiting friends, stopping in interesting places, and hiking in parks all along the way. He is a dedicated fan of San Francisco Giants baseball and Golden State Warriors basketball. Steve O and Attila live in El Sobrante, California, in the San Francisco Bay Area's East Bay. Attila on the trail while camping at the Oregon Dunes in Jessie M. Honeyman State Park, June 2008.